We’d love your help. 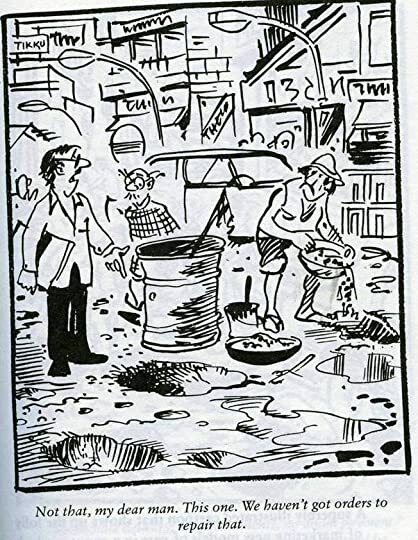 Let us know what’s wrong with this preview of The Very Best of the Common Man by R.K. Laxman. 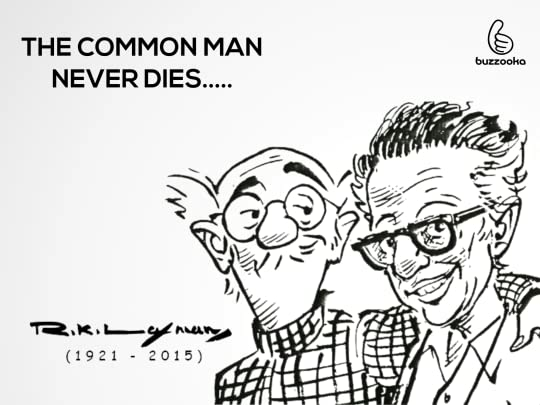 The Very Best Of The Common Man is a tribute to one of India's best-loved cartoonists, R. K. Laxman. It presents a collection of some of Laxman's cartoons based on The Common Man, a character that appeared in Laxman's daily cartoon strip (titled You Said It) for the Times of India publication. The Common Man, an average man representing the hopes and fears of the masses in The Very Best Of The Common Man is a tribute to one of India's best-loved cartoonists, R. K. Laxman. It presents a collection of some of Laxman's cartoons based on The Common Man, a character that appeared in Laxman's daily cartoon strip (titled You Said It) for the Times of India publication. The Common Man, an average man representing the hopes and fears of the masses in India, remains one of the best characters in the history of Indian cartooning and illustration. He is depicted as a silent witness to all the socio-political happenings that are presented in the cartoons. Through the Common Man cartoons, Laxman explores every aspect of living in contemporary India. From political instability to economic crises, from the deeply entrenched corruption to the woes of householders, Laxman portrays exactly what it means to live and experience the real India. The book presents some of the best cartoons featuring The Common Man in all his mute glory. To ask other readers questions about The Very Best of the Common Man, please sign up. I never had the privilege of reading the daily political cartoons of the excellent R K Laxman when I was a kid, simply because my family never subscribed to Times of India newspaper which published Laxman's cartoons, and that delayed my introduction to his Common Man. I still remember my first Common man: A simple penciled cartoon of a family staring blankly at an empty wall, with the caption running along the lines "The television is in the repair shop, and the family just don't know what else I never had the privilege of reading the daily political cartoons of the excellent R K Laxman when I was a kid, simply because my family never subscribed to Times of India newspaper which published Laxman's cartoons, and that delayed my introduction to his Common Man. I still remember my first Common man: A simple penciled cartoon of a family staring blankly at an empty wall, with the caption running along the lines "The television is in the repair shop, and the family just don't know what else to do". I read that one about 12 years ago, and it stayed with me ever since. This 200-page collection contains 100 single paneled cartoons Laxman drew during his long career. His satirical panels presented here hits hard on the evergreen hypocrisy of politicians, unfulfilled election promises, bribes, natural disasters, damaged roads, cricket, child labor and everything under the sun that ails an Indian common man! In my opinion, naming this collection as The very best of the common man is misleading. These 100 panels only scratch the surface of Common man's legendary run, and some of the panels presented here repeat itself like old wine in a new bottle. I would've loved to see a more diverse collection. Also, I thought it would be interesting to know which year each individual cartoons were originally published, but that information was missing too. Nevertheless, This small book contains the bold legacy of India through the eyes Laxman's common man, which reminds us to look at everyday affairs without prejudice and manipulations, the two factors which populate our current day media. Offhand I can think of few brothers as extraordinarily successful in their fields, and certainly as widely admired, as RK Narayan and his younger sibling RK Laxman. Perhaps the Attenboroughs come close, David and Richard. Or in earlier times, Lawrence and Gerald Durrell. RK Narayan, the beloved author, had many of his works illustrated by his cartoonist brother, RK Laxman, to great effect, witness the Indian Thought edition of RKN's memoir My Days. This 2012 Penguin compilation features Laxman's c Offhand I can think of few brothers as extraordinarily successful in their fields, and certainly as widely admired, as RK Narayan and his younger sibling RK Laxman. Oh yes, this village has improved a lot, sir- it's almost like a big city now- no water, no electricity here either! Two quibbles: no dates on the cartoons, which would have helped contextualise them and the short introductory comments to help explain the cartoon (not by Laxman), are mostly unnecessary. Said to be the second oldest profession in the world, bearing a close resemblance to the first, politics has always been subjected to searing scrutiny and bitter ridicule. Especially in a highly populated country like India, politicians have been offering a lot of free ‘entertainment’ to the public, next only to cinema and cricket. Stupid statements, senseless actions, scams, and scandals – you ask for it and the Indian politicians only feel obliged to deliver it for your ‘pleasure’. Cartoonists are that rare breed of people who make the caricatured images of theirs speak more than a thousand acerbic words mocking the actions of the politicians. Especially those cartons that appear daily in the newspapers seem like the oasis amidst all the chaotic news articles. 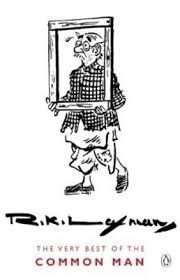 R.K. Laxman is the doyen of the cartoonist profession in India. Having had a prolific career that spanned more than half a century, he is one cartoonist who can really claim to have seen it all and drawn it all. This book contains some hundred plus cartoons of Laxman that have withstood the test of time. A mere glimpse at the cartoons and you will realize that our politicians have remained as pretentious, as egoistic, and as dumb as ever. Indulgence in boastful talks, broken promises, opportunistic behaviors have all been the bane of Indian politicians always. Hence some of the satiric jibes that Mr.Laxman had aimed at the politicians of old remain relevant enough for our ‘leaders’ of these days as well. Leaders that visit their constitutions only during election campaigns, who don’t think twice before throwing senseless percentages and figures without showing any real progress on ground, the servile acolytes who need to flatter their bosses even during their visits to places hit by natural disasters – Laxman has drawn them all, keeping his ‘Common Man’ – a lovable bald old man – as a silent observer. Just a complaint though. The cartoons have all been published on one side while the opposite side is used for a caption of only a line or two. Either they have opted to present the book so due to the poor, thin quality of the paper that could have made the images on different pages look overlapping and thus messy. Or, they could have done so to make this book appear in a decent size. But this seems to be a blatant wastage that the publishers could have very much avoided. I picked up this book in Delhi airport to kill time and completed it in one hour. This is a selection of great works of noted political cartoonists(politoonists) Late R.K.Laxman.I must confess I am a fan of his work and his cartoons were the first thing I read in the Times of India. Coming back to the book,its left leaning but is awesome .The main targets are politicians,bureaucracy and education system and are relevant even today.Its a book for all readers. Since,I don't think I have it in me to I picked up this book in Delhi airport to kill time and completed it in one hour. This is a selection of great works of noted political cartoonists(politoonists) Late R.K.Laxman.I must confess I am a fan of his work and his cartoons were the first thing I read in the Times of India. this was my first read of a cartoonist's book. it was a wonderful experience. the cartoons were so specific and natural that it strikes a chord with the reader. the cartoons were based on the common problems we face living in a developing country like India. this was beautifully captured with the image of the common man in the background of every drawing. An interesting book of the best cartoons by R.K.Laxman for the everyday newspaper. They make fun of various things that happens in politics, the economy, etc and at the same time make you think about what is wrong with them. The best cartoonist of our country, best of his work and then this comes, the very best of the best cartoonist. How can one rate it less than the best of the rating! Pure humor, amazing creativity and wonderful satire! Need one have to say more? The evergreen classic Laxman. The beauty of his work is that he can bring out the complexities and the satire in our everyday life so vividly by use of a single picture. A great artist and a political commentator- His work from even 50 years back is still relevant & fresh in today's India. Loved it. Very Creative. still relevant .. and very funny. A very quick read that can be read end to end over a cup of coffee. Still, that short time was enough for the common man to teach me a lot more about India than some history books ever could. Dates on which the cartoons were originally Published, if provided would have made reading experience much better. This is one of the best illustrative books I have ever come across. Very funny collection of RK Laxman's cartoon .. This book is a masterpiece from a master cartoonist,R K Laxman. These.These cartoons make you cry, laugh and above all,see the irony of common man's life.The villains as projected by Laxman are rising costs,inflation,poor managerial practices,poverty,long pending political issues,unscrupulous politicians and above all, most important, wrong priorities assigned in life by persons, politicians and everyone. Published by Penguins in 2012,it has been hailed by TIME magazine "..What's common about th This book is a masterpiece from a master cartoonist,R K Laxman. These.These cartoons make you cry, laugh and above all,see the irony of common man's life.The villains as projected by Laxman are rising costs,inflation,poor managerial practices,poverty,long pending political issues,unscrupulous politicians and above all, most important, wrong priorities assigned in life by persons, politicians and everyone. Published by Penguins in 2012,it has been hailed by TIME magazine "..What's common about this character is that like most Indians,he sees his country being forced through endless dignities by its leaders and doesn't even whimper in protest." Loved this book for its humorously subtle observations in a common man's life. One could relate to almost every aspect in the book. Its also a reminder of how politics,religion and society have changed so little since they were observed by the great cartoonist!!! the humorous collection of cartoon sketches featuring the ever present 'common man' and focusing on the great many problems and situations faced by the average Indian and most of which are highly relevant even today.. a good read.. Mind blowing. And just as applicable today as it was a decade or more back. R K Laxman was a genius. And I am a nobody to have any sorts of rights to review it or comment on it. Hence I wont even try. Really the best of the best by Mr. Laxman. Can summarize in one word..timeless!! good read or should I say good watch.? All political cartoons still very much relevant! lovely portrayal of the mute common man. A wonderful collection of timeless cartoons, mainly based on Indian political scenarios and events. The Very Best of R K Laxman. Awesome book nice humour. Political satire at its best. Laxman at his best. Recommend this to everyone who loves art or any one who loves politics. Brilliant cartoons! excellent lines with a dose of subtle political humor! '''Rasipuram Krishnaswamy Iyer Laxman''' (born October 23 1924, Mysore, India) is an Indian cartoonist, illustrator and humorist. He is widely regarded as India's greatest-ever cartoonist and is best known for his creation ''The Common Man". 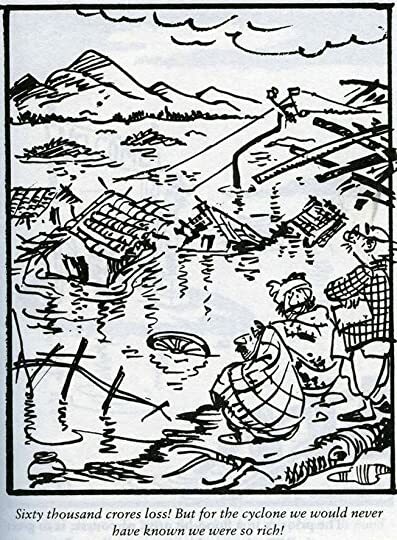 R. K. Laxman was awarded the prestigious Padma Bhushan by the Government of India. He has won many awards for his cartoons, including Asia's top journalism awa '''Rasipuram Krishnaswamy Iyer Laxman''' (born October 23 1924, Mysore, India) is an Indian cartoonist, illustrator and humorist. He is widely regarded as India's greatest-ever cartoonist and is best known for his creation ''The Common Man".